...chocolate makes it go down easier. Who am I? Why am I quoting The Princess Bride? The Princess Bride is my absolute FAVORITE movie-OF ALL TIME. (If you are not familiar with it, you're going to be quite confused, as I will be quoting in frequently. My apologies.) I stumbled upon it one day when I was 14, was intrigued by the title, watched it-and I.WAS.HOOKED! I literally watched it approx. 5 times a day for 2 weeks (then I had to return it to the library...but my mom bought it for me shortly after because she was tired of my whining). And, I was delighted to find out once we started dating, it is Michael's favorite movie too! He (lucky duck) actually was raised with this movie, it's one of his family's favorites, as well. We own two copies-mine is the "Buttercup Edition" and his is the "20th Anniversary edition". PLUS-our wedding song (you know...for our first dance) is going to be "Storybook Love", which is the movie's theme (and also our ring-tones for each other). The Princess Bride was severely underrated when it came out-but, obviously, has a HUGE cult following. It has everything! "Fencing, fighting, torture, revenge, giants, monsters, chases, escapes, true love, miracles..."
Romance: "This is true love-you think this happens every day?" Drama: "My name is Inigo Montoya, you killed my father, prepare to die." Comedy: "Stop that rhyming now, I mean it!" "Anybody want a peanut?" When I saw that MyFudo was looking for guest bloggers (for a contest which was then canceled) to speak about their favorite movies + a recipe corresponding, my choice was obvious. But what to make? One idea that we thought of were Peanut-Buttercup-Cookies, which I thought was cute, but I just kept going back to this idea: Iocane-Dusted Brownies of Unusual Size. "What you do not smell is called Iocane powder. It is odorless, tasteless,dissolves instantly in liquid..."
My first thought was something that had "Iocane powder" dusted on it--AKA, powdered sugar. Then, I got a little stumped again, I was thinking brownies, but it was stilling missing something...enter Michael's idea. Of course! 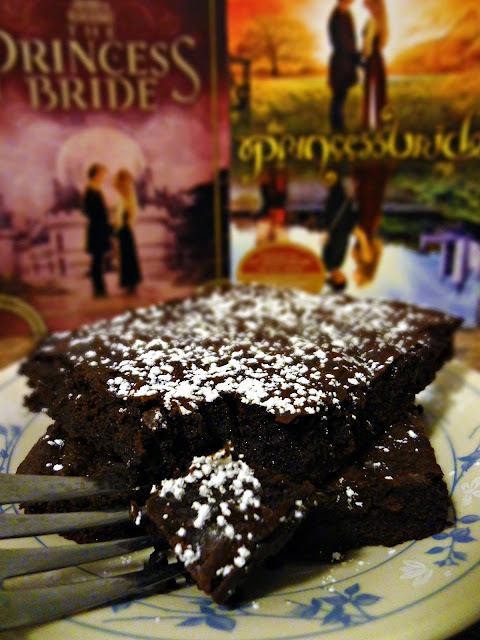 BROWNIES of Unusual Size...because...you know...no one likes rats, but EVERYONE likes brownies! So that is what I did-and let me tell you, these were GREAT! Not only are the HUGE and pretty because of that "Iocane" dusting, but also they are so fudgey and dense and delicious. 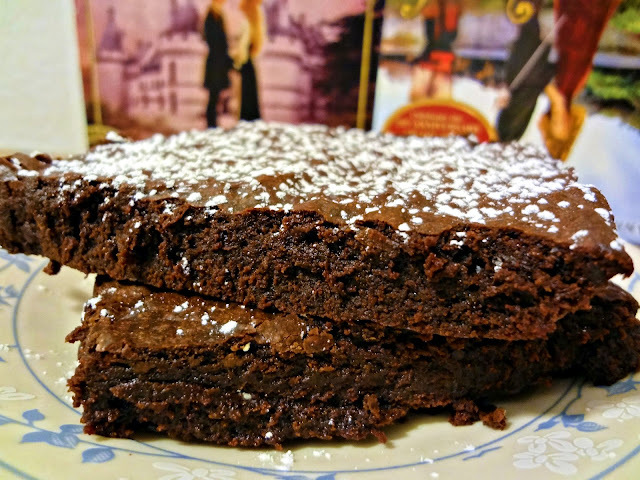 And, an added bonus, if you are not a "princess bride" and short on funds, this recipe is great because the only chocolate it uses is cocoa powder-none of that super expensive fancy chocolate. 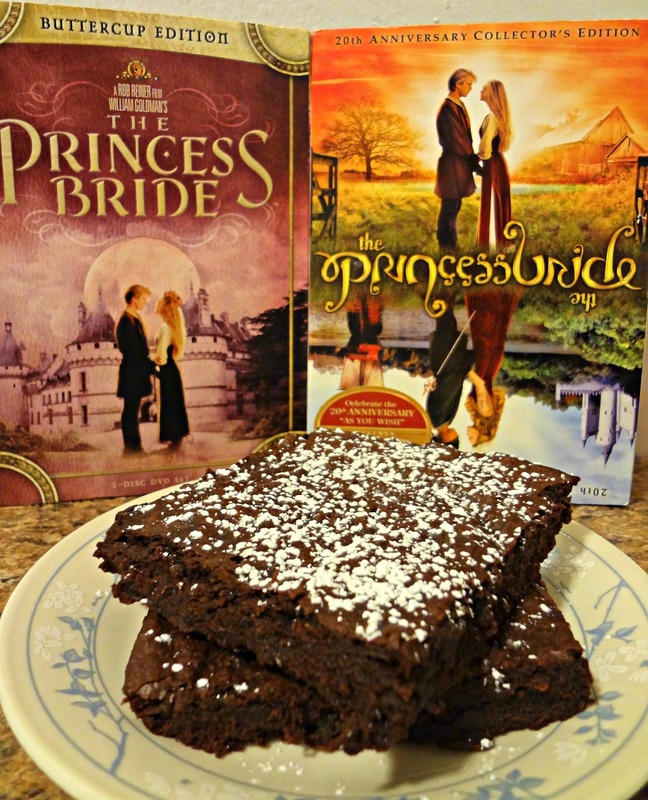 I advise that you immediately make these, grab your significant other, your best friend, or just your wonderful self, sit down and watch The Princess Bride while eating these huge, decadent, Iocane dusted, Brownies of Unusual Size. Position rack in lower third of the oven. Combine butter, sugar, cocoa, and salt in a medium, heatproof, bowl. Microwave 1 minute and 30 seconds on high power. Remove and stir until smooth. Let cool to warm. Stir in vanilla with a wooden spoon or rubber spatula. Spread evenly in the lined pan. Bake 25-30 minutes (until a toothpick inserted in the middle comes out slightly moist). Lift end and transfer brownies to a cutting surface. Cut into as many squares as you desire--in this case, UNUSUALLY LARGE SIZED squares. Dust with powdered sugar....oops....I mean...Iocane powder *wink* But really....don't. It "is among the most deadly poisons known to man." So unless you've spent years building up an immunity, like Westley, stick with the powdered sugar. I won't tell. Miracle Michael: Bye Bye! Have fun making these brownies! Kayle:...Think they'll be able to make them? Miracle Michael: It would take a miracle. But seriously, they're simple, and I hope you make these as often “As you wish”. Oh my-and you've already married him? You need to get on this, stat! Hey, I'm so glad to have found this cooking actress! I think you blog title's really cute. I'm no actress, but I love watching movies, particularly romantic comedies. Guess what? The Princess Bride is one of my fave too!! Your brownie bars look yum! Looking forward to browse through the recipes some more, cheers! I love Princess Bride so much and love all of the references to it in the recipe! My hubby loves it too and we quote it quite often. Once my 5 year old gets a little bigger, we'll get him hooked too. :D Have you read the book? BTW, I love your recipes! I also love the way you describe each one and the stories you tell.